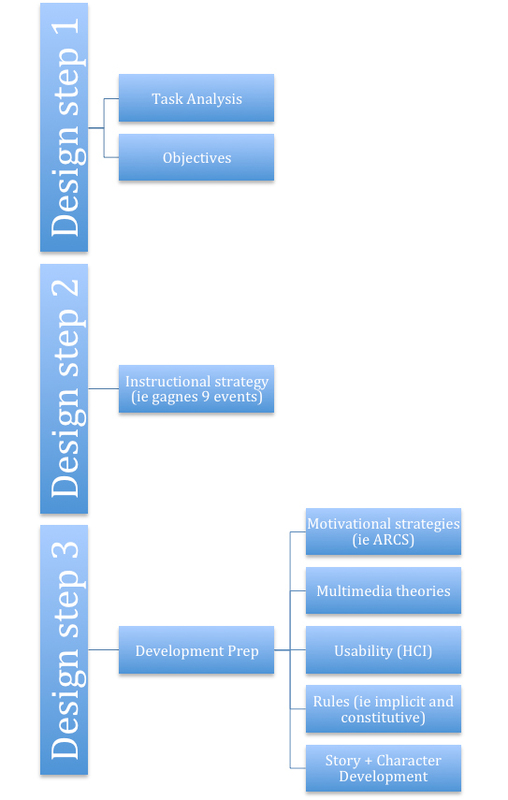 This is an overview of the design phase within ISD. task analysis – this is the instructional flow of content and can be a concept map (how your objectives will be accomplished). It should really be a visual of your learning objectives and help ensure that all of the content is going to be taught. This is where you will sort through content and figure out the order that it needs to be taught. What learning taxonomy are you using? You need to make sure you are using a learning taxonomy here. This document can be done in unison with your learning objectives. Objectives – Each piece of content should be a learning objective. Each learning objective should have an assessment item. Each objective should be written in some format that includes the audience, behavior, condition, and degree. Each objective should be able to be seen in your task analysis. You must be using a learning taxonomy here. If you do NOT know what a taxonomy is I suggest using Merrill’s Component Display Theory. Instructional strategy – How will this content be taught? What instructional strategy are you using? You need to look at your objectives and task analysis and determine the best instructional strategies. These could include gagnes 9 events, problem base learning, etc. First determine if you solution is direct, indirect or experiential then figure out what strategy fits that methods. This is one of the most important parts of the ISD process. Most generic and bad training does NOT use an instructional strategy. Step 3 – Development prep. Keep in mind that not all of these apply to all situations so take your case and see what fits (for example CBT will use the multimedia theories whereas instructor led training may not). These are done prior to storyboard development or in the beginning stages of storyboard development when working on a prototype. This step can be done consecutively with prototype development, which is the first stage of development. When developing these I am usually beginning to work on my interface which then gets put into the prototype in the development phase – this will involve the graphic designer and developers. Motivation – Can you incorporate any motivation theories (ie ARCS model) into this instructional strategy? How? Multimedia theories – Are we going to use the multimedia theories? This will apply to computer/technology based instruction. If so, which ones? Usability (HCI) – Where are buttons going to be placed? Do we actually know where they should go or are you just making this up? Make sure someone is well versed on HCI (human computer interaction) before deciding this stuff. How does fitt’s law apply? The golden ratio? Grids? etc. How can I make this user friendly? Are my color choices good? A design document might be developed here to help the developer and other designers. This is really where interface design begins. The instructional designer should understand HCI if they are going to design an interface. Story and Character Development – This only applies to CBT, certain instructional strategies, gaming, and simulations. Who are my main characters? Do they have an ARC? What is my story? What is the scenery like? What are the graphics like? What are the sounds like? At this point I move into prototype development. However, I place this in the development phase of ADDIE but it really happens just after design and before development. Many like to put it in the design category and that is fine, assuming its the last step. Posted in Instructional Design and tagged design, instructional design.